Born in Chiba Prefecture, Japan, 1947. Kozo Miyoshi is one of the representative contemporary photographers of Japan. He began to take photographs of views engaging to him with an 8×10-inch camera in 1981, and has made series of art works more than quarter century. Make several photography travels in Japan and pursues his own photography with an 8×10-inch camera in those impressive works such as “Sakura” (2003), “Seagirt” (2004), “Tokyo Drive” (2006), and “Somewhere, Sometime” (2007) are well known. 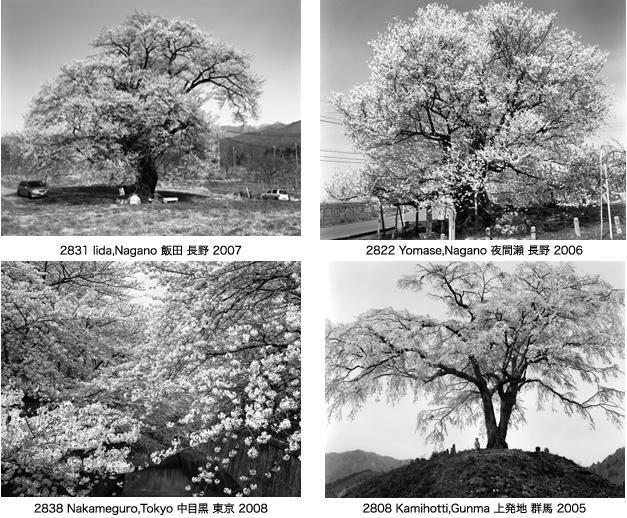 Miyoshi began to photograph Sakura (cherry blossom) from 1998. Every spring, traveling toward north with the “cherry blossom front”, he meets Sakura and photographs what he likes. There is a Sakura charms many people, and there is a Sakura nestled in landscape. Miyoshi, who continues to photograph Sakura as sight in the spring, becomes to photograph Sakura itself, and faces Sakura again. Miyoshi has photographed many years with the same spirit and attitude. “I think photograph is that, by film and lens, and printing on photographic paper in the darkroom, those are tightly-bound, the whole thing is photograph. It is important to me to continue those things,” he says. Once he decides subject to photograph, he travels many places to photograph, and makes photographic prints. He makes rules to himself and continues “photograph” steadily with the same spirit and attitude as if he is a monk.